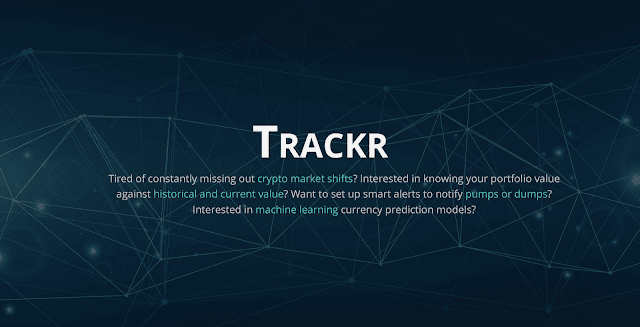 Hallo all, this time there is a new Tokensale that announces its project, Trackr, Trackr is a mobile app that offers real-time warnings on market cryptocoin when there is a change in the market, so if you are a person who feels that often skip the market during dumps or Pumps, this platform is very useful. Continuing to the explanation of this Trackr project, Trackr has an all-in-one interface to view and manage existing portfolios, predict which cryptocoins are safe to invest and which are not. In addition to the future will also be developed data history method so users can more easily analyze that occurs in every market. The Track Token (TKR), On this platform there are features that can be used for free without having to subscribe and can be utilized but there are also features of advanced pay per month which of course has more value as in general premium features on every service out there. TKR berjenis ERC20 yang bekerja pada block ethereal. Exchange akan di lakukan pada blockchain ether selama fase penciptaan. 1 000 000 Additional TKR Tokens will be available for ICO pre-token exchange purposes to ICO tokens. Trackr Is a mobile app for your smartphone, as well as trackr receives input for additional features that would help trackr for better and more useful for users. Feature features already available are notifications when there is a change in the market cryptocoin, and sent to email or sms (depending on each country) and for other features will follow. Feature of the feature if activated continuously can cause heavy load on your device, so you should use the appropriate features.